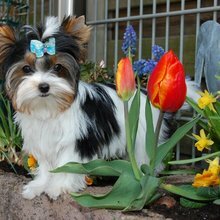 The Biewer (pronounced ‘Bee-vair’), also known as the ‘Biewer Terrier’, ‘Biewer a la Pom Pon’, ‘Biewer Yorkshire Terrier’, ‘Biewer Yorkshire’, or ‘Biewer Yorkie’ is a variant of the Yorkshire Terrier. The Biewer originated in Hunsruck, Germany in 1984 when Werner and Gertrude Biewer’s, award winning blue and tan Yorkshires ‘Darling von Friedheck’ and ‘Fru Fru von Friedheck’ bore a puppy, named ‘Scneeflocken von Friedheck’, with a piebald coat (large, asymmetrical black and white patches) due to gene mutation. The Biewers continued breeding their Yorkshires to achieve four white legs, chest, belly and tip of the tail. The Biewer Yorkshire was recognized by the ACH in 1989 and first imported to America in 2003. The Biewer Terrier Club of America, Inc. is the only American club supported by the founder of the Biewer Breed. The Biewer is 20-23 cm (8-9 in) tall and weighs 2-3 kg (4-7 lbs). Biewers have a small, flat head, level or scissors bite, dark, intelligent eyes, and small, highly set, ‘V’-shaped ears. They have a level back and tail carried high. The Biewer has a long, straight, silky coat. Its head can be two or three-colored: black/blue, gold white; black/blue, gold, or gold, white in good symmetry. Biewers have a white underbelly, chest, legs and tail tip, and blue or black and white back. The color and texture of the coat are perhaps the most important show trait. Show dogs are groomed with the hair grown out to 3/4 or full body length and parted down the middle of the back. Biewers have no undercoat and shed little. Biewers become attached to their families, but most maintain some measure of independence. The Biewer is lively, bold, and intelligent. It has a childlike, playful personality that holds true to the terrier breed. It barks when it senses danger. Biewers become attached to their families, but most maintain some measure of independence. The Biewer is lively, bold, and intelligent. It has a childlike, playful personality that holds true to the terrier breed. It barks when it senses danger. The Biewer is tolerant of all children provided they respect their personal space. Due to its small size and bold temperament the Biewer is not recommended for young children unless carefully supervised. The Biewer can occasionally be a bit too brave when dealing with larger dogs, but gets along fine with cats and other household pets. Biewers prefer life indoors, and are not suited to cold climates. You can find Biewer puppies priced from $350 USD to $4500 USD with one of our credible breeders. Browse through our breeder's listings and find your perfect puppy at the perfect price. The Biewer is tolerant of all children provided they respect their personal space. Due to its small size and bold temperament the Biewer is not recommended for young children unless carefully supervised. The Biewer can occasionally be a bit too brave when dealing with larger dogs, but gets along fine with cats and other household pets. Biewers prefer life indoors, and are not suited to cold climates. Show Biewers require intensive brushing and combing on a daily basis and bathing every couple weeks. Many are trimmed professionally. The Biewer’s hair should be kept out of its eyes by a latex band or a bow. Pet Biewers usually have a shorter ‘puppy cut’ for easier maintenance. For either cut, loose hairs should be regularly removed from ear passages. Biewers have a lifespan of 12-15 years. Biewer puppies can be susceptible to hypoglycemia (diagnosed by listless behavior and shakiness). Biewers under 3 pounds are better suited for adults due to their diminutive size. The Biewer is intelligent and capable of learning quickly, but some prolong the process with their independent, stubborn nature. The Biewer can have most of its needs met through indoor play, but still prefers a daily walk or romp in a fenced-in yard. Biewers are well suited to apartment life. Biewer Puppies for Sale - Shipped Worldwide! Finding the right Biewer puppy can be dog gone hard work. PuppyFind® provides a convenient and efficient means of selecting and purchasing the perfect Biewer puppy (or Biewer puppies) from the comfort of your home, 24 hours a day, 7 days a week. Take advantage of our PuppySearch or leisurely browse our directory of hundreds of dog breeds, Biewer dog breeders, Biewer dogs for adoption, and Biewer puppy for sale listings with photos and detailed descriptions. Some Biewer puppies for sale may be shipped Worldwide and include crate and veterinarian checkup. Many Biewer dog breeders with puppies for sale also offer a health guarantee. With thousands of Biewer puppies for sale and hundreds of Biewer dog breeders, you're sure to find the perfect Biewer puppy.